The global scleroderma diagnostics and therapeutics market is an extremely fragmented and competitive market, with a presence of a large number of players operating in it across the globe, states a research study by Transparency Market Research. The leading players in the market, such as Boehringer Ingelheim, Gilead Sciences, Inc., Cytori Therapeutics, Inc., Bayer AG, Cumberland Pharmaceuticals, Inc., Pfizer, Inc., and Sanofi are focusing on introducing new and effective drugs and therapeutics in order to enhance their presence across the globe. In addition, the increasing number of strategic collaborations and the rising number of clinical trials are anticipated to benefit the market leaders and encourage the growth of the overall market throughout the forecast period. The rising research and development activities are likely to accelerate the overall growth of the market in the near future. 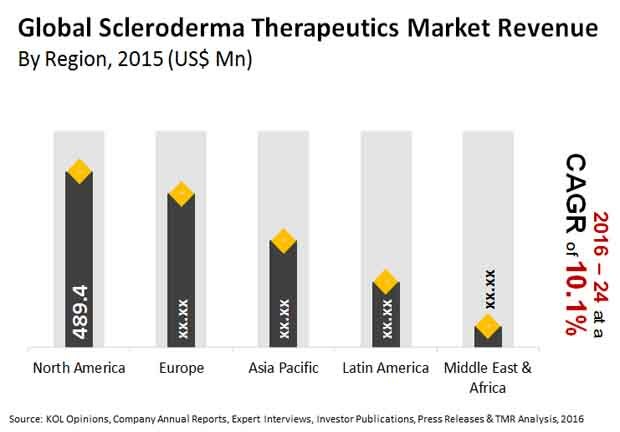 As per the research study by Transparency Market Research, in 2015, the global market for scleroderma diagnostics and therapeutics was worth US$1,633.5 mn. The market is likely to reach a value of US$3,663.7 mn by the end of 2024, registering a strong 9.70% CAGR between 2016 and 2024. Among the key regional segments, Europe and North America are projected to witness a healthy growth throughout the forecast period. These two regions are expected to account for a major share of the global scleroderma diagnostics and therapeutics market, thanks to the presence of several leading players in these regions. In addition, the availability of advanced healthcare infrastructure is the important factor expected to encourage the growth of the North America and Europe markets in the coming years. On the other hand, the key players in the market are likely to focus on the untapped markets in Asia Pacific region in order to enhance their presence and gain a competitive edge in the global market. The rising potential to adopt new therapies and the easy availability of generic medications are estimated to accelerate the growth of the Asia Pacific market in the near future. On the basis of drug class, the global market for scleroderma diagnostics and therapeutics market has been classified in order to offer a detailed overview of the market. Among the key segments, the immunosuppressive agents segment is estimated to lead the global market throughout the forecast period. The rising preference of patients towards using immunosuppressive agents is expected to accelerate the growth of this segment in the next few years. Furthermore, the prostacyclin analogues segment is anticipated to witness a healthy growth in the next few years, states a TMR analyst. A significant rise in the number of clinical trials and the rising acceptance of effective and new therapies by patients are the major factors expected to augment the growth of the global scleroderma diagnostics and therapeutics market in the next few years. In addition, the approval of new drugs for several medical conditions related to scleroderma and the rising number of opportunities in emerging economies are anticipated to encourage the growth of the overall market throughout the forecast period. The improvement of the healthcare infrastructure and the increasing inclination of patients to spend on advanced healthcare facilities are estimated to supplement the market’s growth in the near future. On the contrary, the global market for scleroderma diagnostics and therapeutics is likely to face several limitations in the coming years, owing to which the market is expected to witness a downward trend. The high cost of treatment and the lack of knowledge among patients regarding the availability of advanced therapeutics are the major factors that are estimated to restrict the growth of the global scleroderma diagnostics and therapeutics market in the next few years. Nonetheless, the rising popularity of medical tourism and the favorable reimbursement policies are projected to offer promising growth opportunities for the leading players operating in the market across the globe.